Quality Billiard Products. Expert Pool Table Service. We are experienced, licensed, insured pool table movers. Let us safely move your table house to house, room to room, or for new flooring. Protect your investment and your back. We offer refelting, cushion rubber replacement, pocket rebuilds, and more to get your old table playing like new. We service all makes and models in the Orange County, California area. New pool table models in different styles to fit your decor. Dining conversion tops, custom builds, import and domestic brands for all playing levels. Quality construction at affordable prices. Professional installation backed by years of experience in the billiard industry. Find accessory kits and playing equipment like cues and balls to get you back in the game. Our family run store has all the billiard essentials with none of the high-pressure sales. Personal service is our top priority. 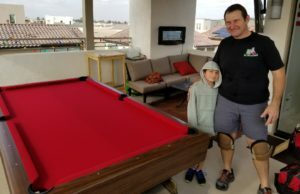 Whether you are servicing an existing billiard table or having a brand new one installed, owner David will take care of you. His 25-year expertise, attention to detail, use of quality materials, and tried and true techniques help us stand above the competition. Our Orange County showroom is run by wife Rory. She can help you pick out a new pool table or supplies. Her graphic design background can even steer you toward a felt color choice. She has a bit of service experience under her belt, as well. She knows a thing or fifty about table construction and the service process. You might even find one of the kiddos taking a break from homework to act as an assistant.